Robert Parker (Wine Advocate #214, Apr 2014). Harvest finished this year on September 25. 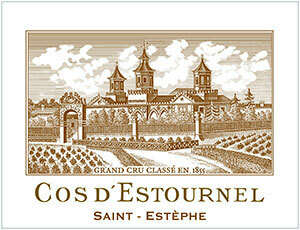 The 2003 Cos d'Estournel is a blend of 68% Cabernet Sauvignon, 30% Merlot and 2% Cabernet Franc. It has a deep garnet-brick color and quite an herbal nose with notions of dried Mediterranean herbs and roasted meats over a core of crème de cassis, stewed plums and unsmoked cigars plus a touch of new leather. Full, rich, concentrated and decadent in the mouth, the palate, though medium-bodied, packs a wallop of fruit with plenty of earthy/savory accents and an herbal lift to the finish. Tasted at Bordeaux Index's "10-Year On" tasting in London. The Cos d'Estournel 2003 has a more flamboyant, sumptuous bouquet compared to the Montrose with luscious redcurrant, raspberry, vanilla and graphite scents that soar from the glass. The palate is full-bodied, but I feel that it has lost weight in recent years as it sheds its puppy fat. This is a very focused Saint Estephe, very composed with fine definition and minerality towards the long finish. At the moment it stands side by side with the Montrose, but both remain true to their style. Tasted March 2013.